Sometimes our dreams are so close we can almost touch them. And sometimes we need to climb a ladder or a tree (or learn to fly) to reach our dreams. In any case, it’s worth the stretch!!! 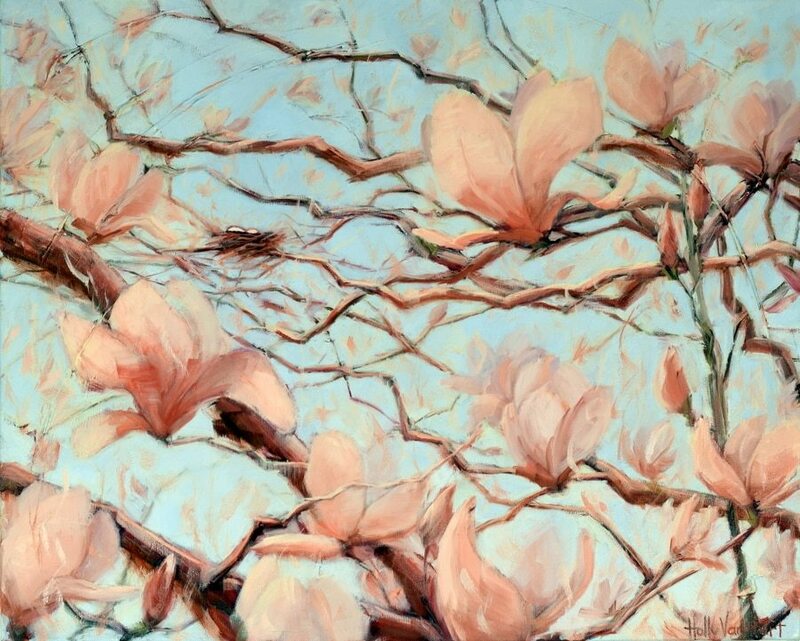 That was what I had in mind while painting the magnolia flowers and nest in ‘Outside My Window’. Outside our windows at home, we’re lucky to have an assortment of oaks, redwoods, and other beautiful trees. No magnolias, although there are plenty in our neighborhood. 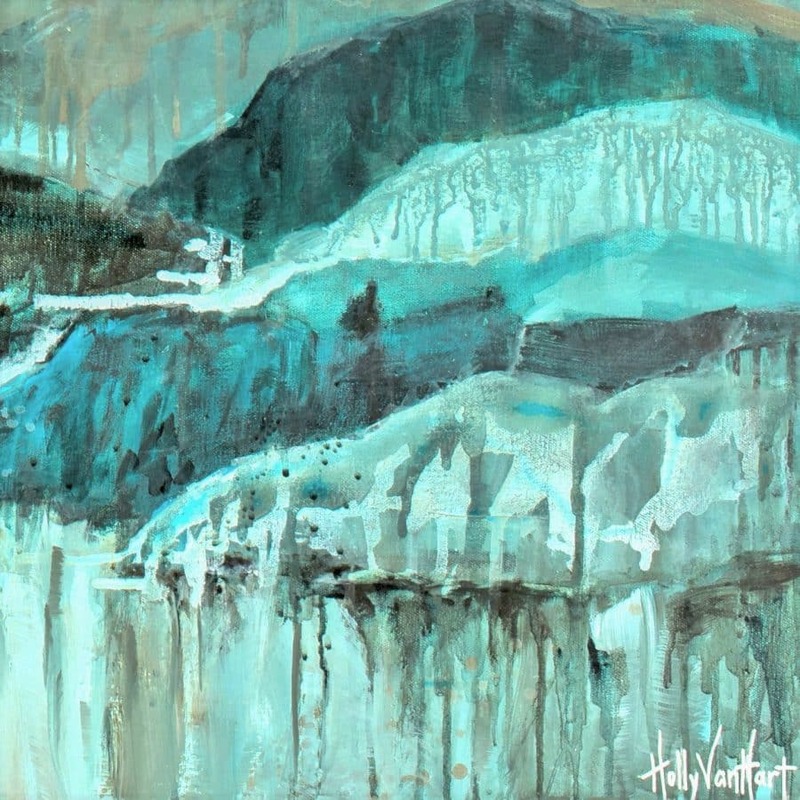 For purchase info, please email me at holly@hollyvanhart.com. Hi there. Meet ‘Possibilities on High’. 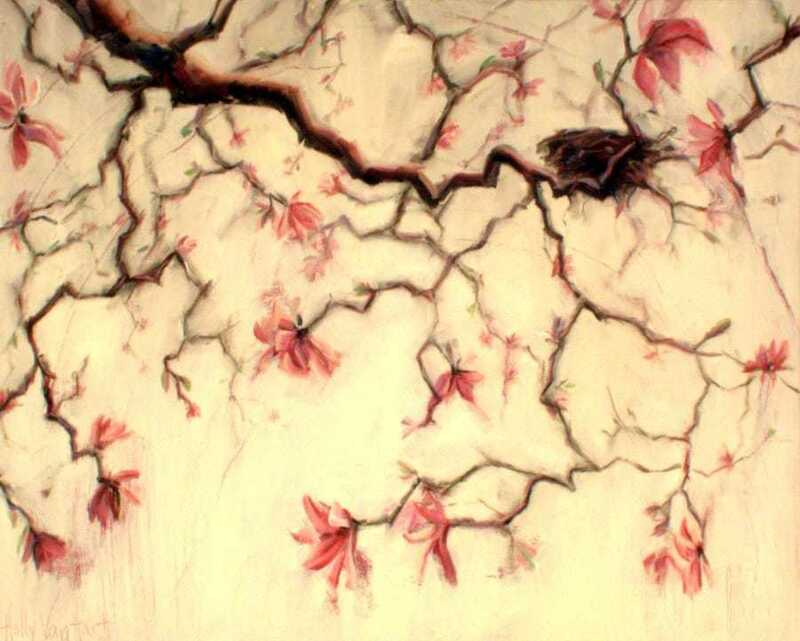 In the upper right of this painting, you can see a big and colorful bird’s nest. It’s sitting up high on the branches of huge magnolia tree, on a warm summer day. The nest looks peacefully and securely settled in the tree. At the same time, it is quite exposed. If I were an egg, I’d love to live in this nest in a magnolia tree (despite the risks of exposure). Would you? What’s the meaning behind Forest Reverie? I am inspired by life’s limitless possibilities, and my abstract nature paintings are meant to spark new excitement about reaching our biggest, boldest dreams. 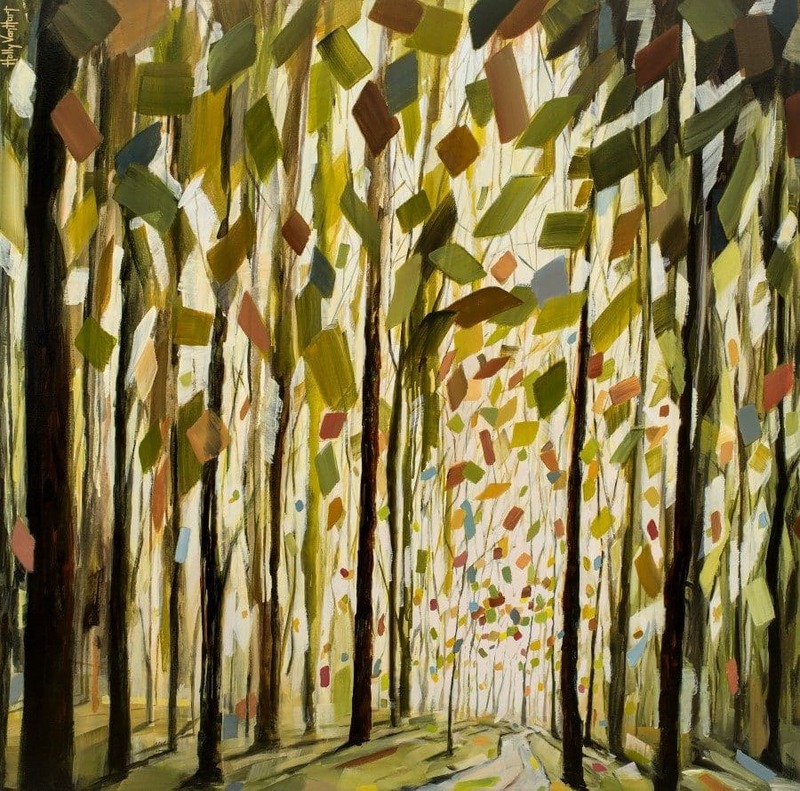 This latest painting ‘Forest Reverie’ represents the beginning of a new year or a new season. Colorful opportunities sparkle all around us, and beckon us to reach them. Will we pick the closest, easiest one, or will we stretch further to find our passion? This blog post is the latest addition to my ‘Top 50 Questions’ list. See/read more here. Do you ever feel like leaving all your obligations and routines behind (at least for an hour or two, or a week or two)? Do you feel like running free? I’d like viewers to look at this painting and get that exact feeling. 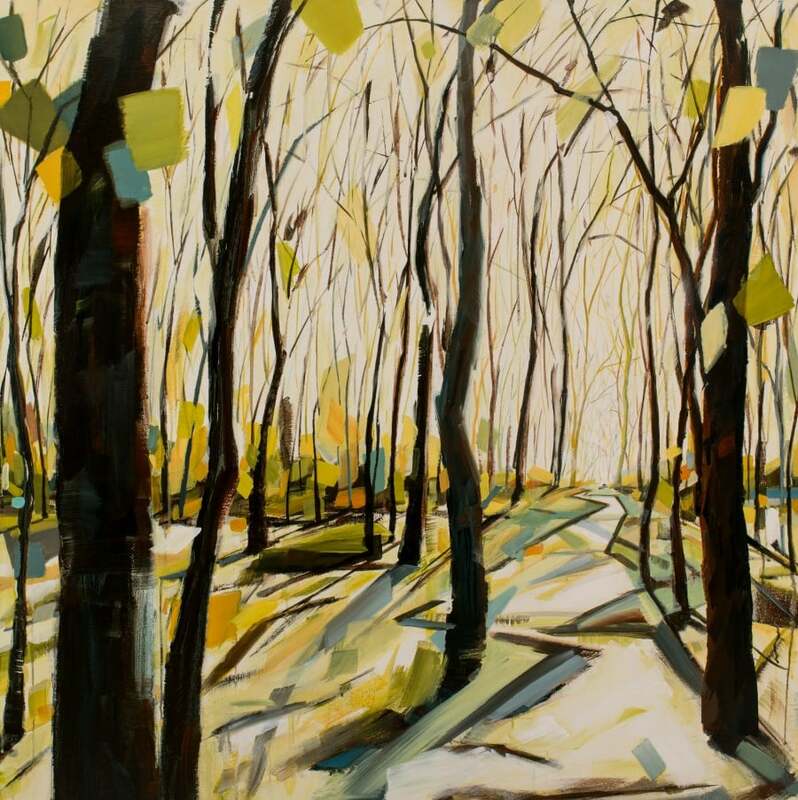 To get lost in the forest and the light, and to feel completely unencumbered. 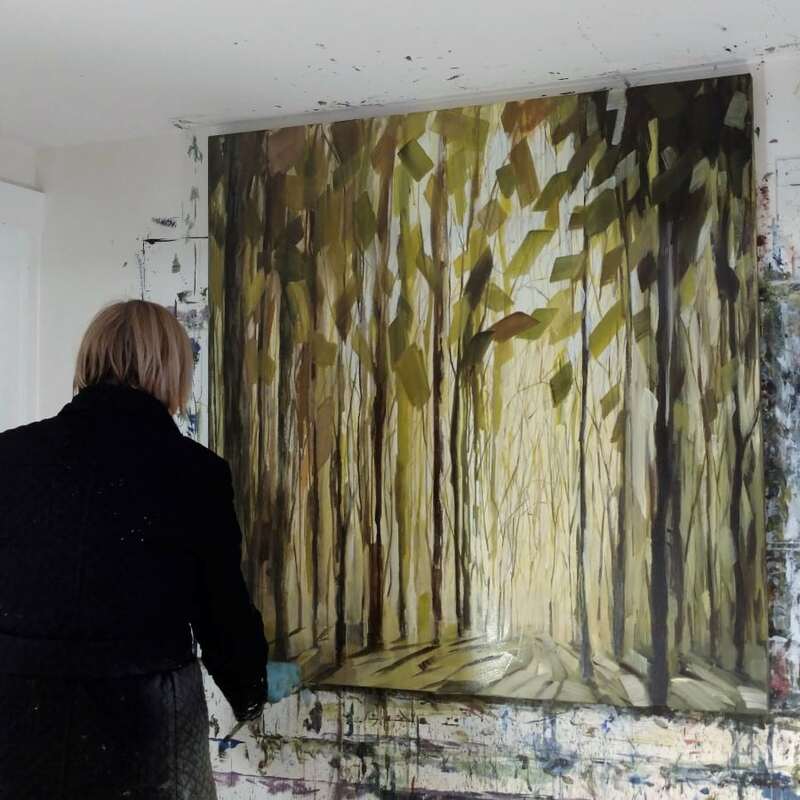 Want to be the first to see new paintings as they are released? Become a VIP! Click for details. With Magnetic Dreams, I was aiming for a moody painting. 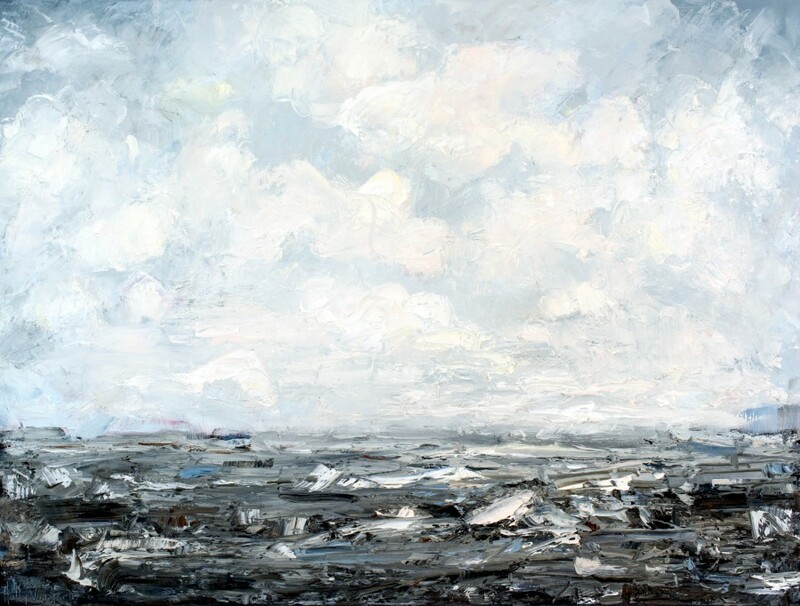 The scene is imagined, drawn from a love of the ocean and memories of many captivating ferry rides. To purchase, email holly@hollyvanhart.com. Free shipping in the US for VIP members. Wishing you a fabulous day! Wishing that your day will be as full of exciting possibilities . . .
as the eggs being incubated in this cozy feathered nest. (Do any birds’ nests actually look like this? Well, yes, kind of . . . learn more here. P.S. 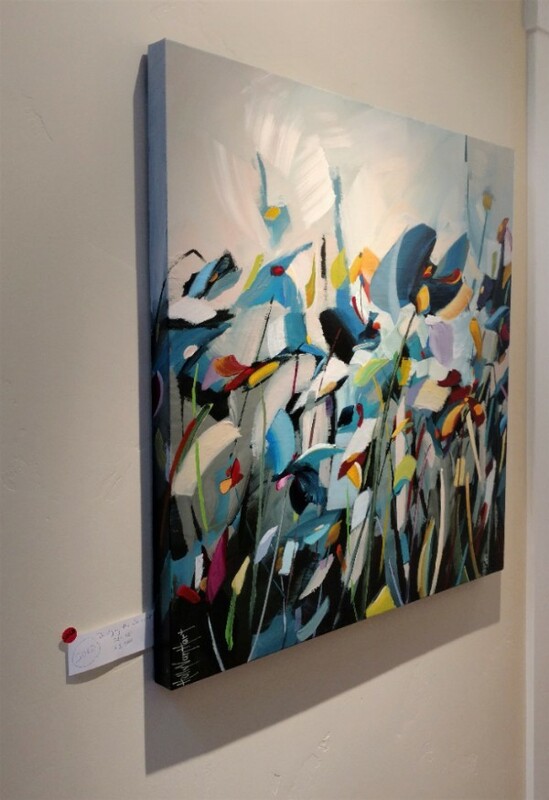 Soft Start was featured in my solo exhibition at the Triton Museum of Art. Would you like to know more about the show? You’re invited to read my interview in the Huffington Post, or to view the pics and videos from the museum exhibition. What things in life fascinate you? What do you really love? High school starts this week for our sons, so we did some family outings to San Francisco and Santa Cruz. 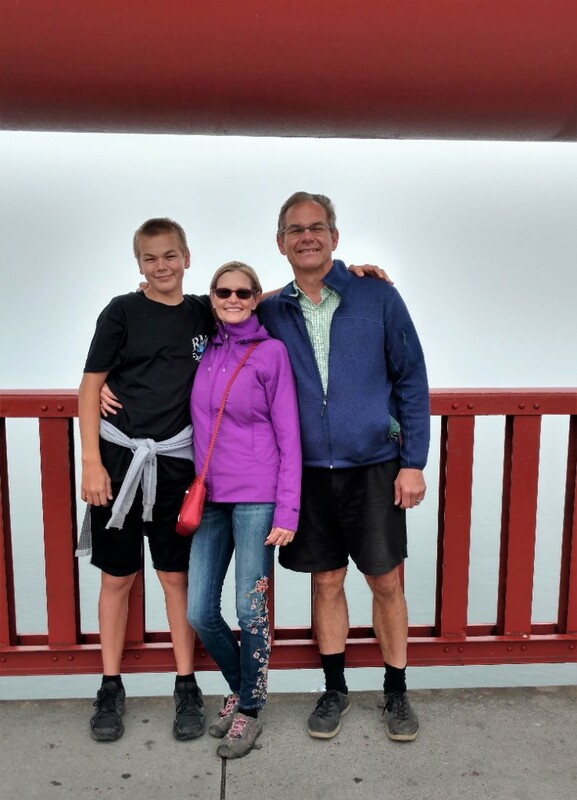 This is us as we walked over the Golden Gate bridge, through a thick fog bank. I really love spending time with these 3 men! 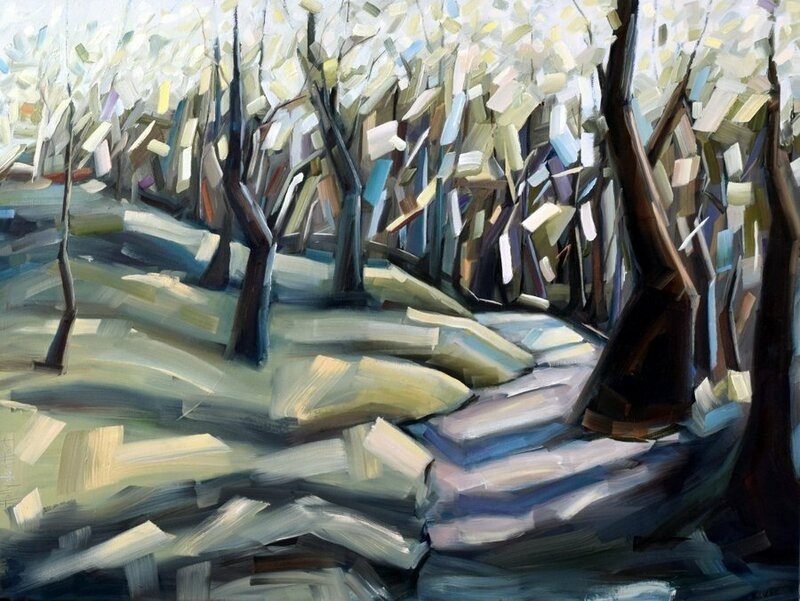 This painting, Following Your Fascinations (oil painting by HVH), is about seeking the things we truly love. It found a new home this week in Los Angeles. Thank you Fred. I hope it brings you a lifetime of happiness! OK, my most amazing friend . . . three cheers to you for following your fascinations! P.S. Into forests or flowers instead? btw, if this email was forwarded to you, and you’d like to get on my VIP list to receive future emails (one every 3 weeks), click here. Copyright © 2018 Holly Van Hart, All rights reserved. You are receiving this because you signed up as a VIP member. Thank you for your support! If you no longer wish to receive these emails, you can unsubscribe. Please contact holly@hollyvanhart.com or 650 646 5590 for availability and pricing. Your email or call is welcome any time. ‘Building the Future’ is about the choices we make for ourselves, and the excitement of preparing for a big life-change. If the hands in this painting look at all familiar, it may be because they were inspired by Rodin’s sculpture ‘The Three Muses”. To see some of my earlier work inspired by Rodin, click here. This is the first of a few paintings in my Possibilities series that were inspired by Rodin. Living in Silicon Valley, we’re close to Stanford University and its amazing Rodin Sculpture Garden. I love any excuse to get back there! Stay tuned for more . 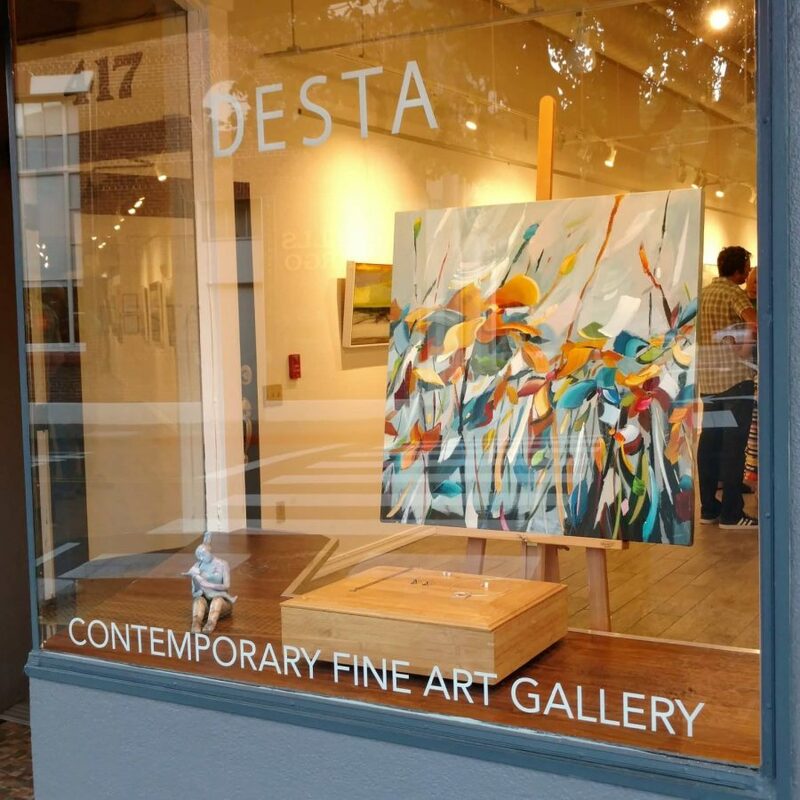 . .
My abstract nature paintings are inspired by life’s limitless possibilities! 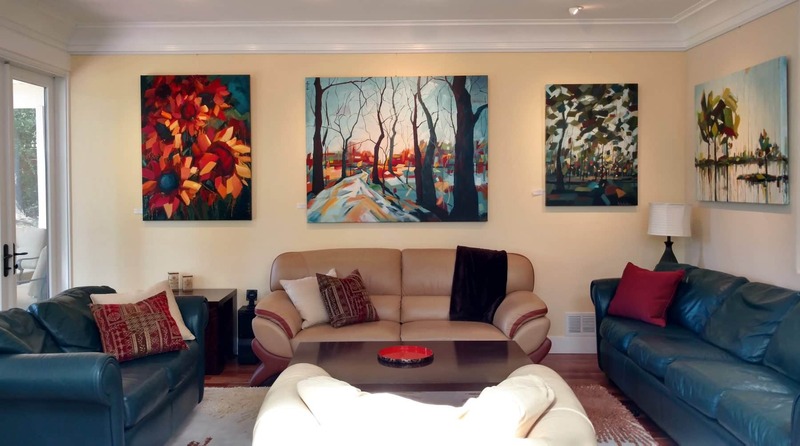 Each painting is meant to convey a sense of plenty, fullness, color, prosperity, and opportunity. Sometimes we have to make choices in life . . . it’s this OR that. Here OR there. Tomorrow OR next week. 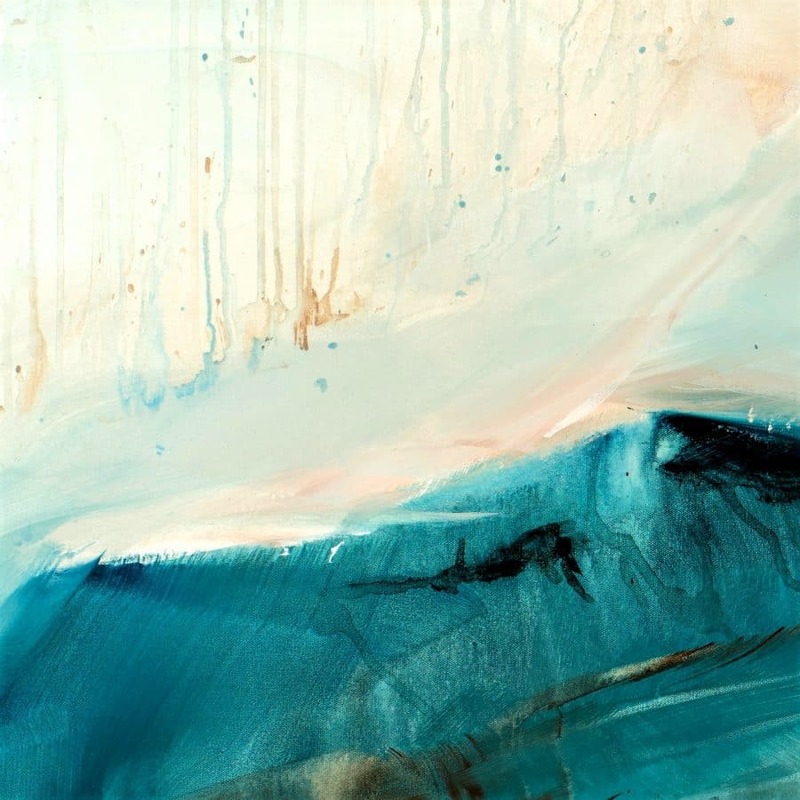 Sky Song is my latest abstract landscape painting. It’s full of heavily textured oil paints, which have a gorgeous sheen. The distant mountains are gray and pink and purple and blue, and have an air of mystery. The sky is alive with light. It’s singing a song. Can you hear it? If you live in Silicon Valley, delivery and installation are free. If you don’t, shipping is free! 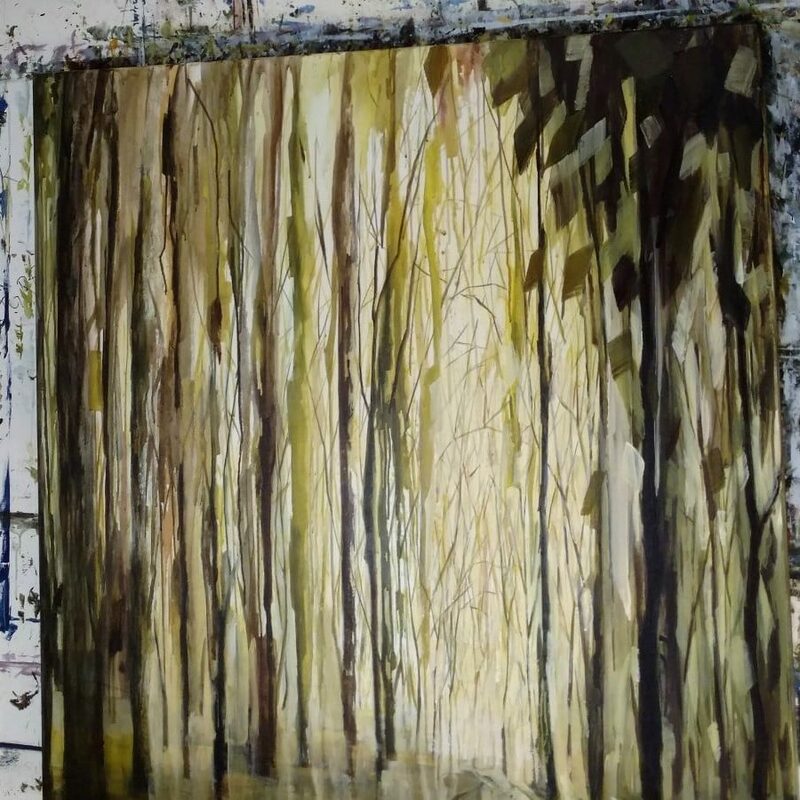 Would you like to see this painting in person? 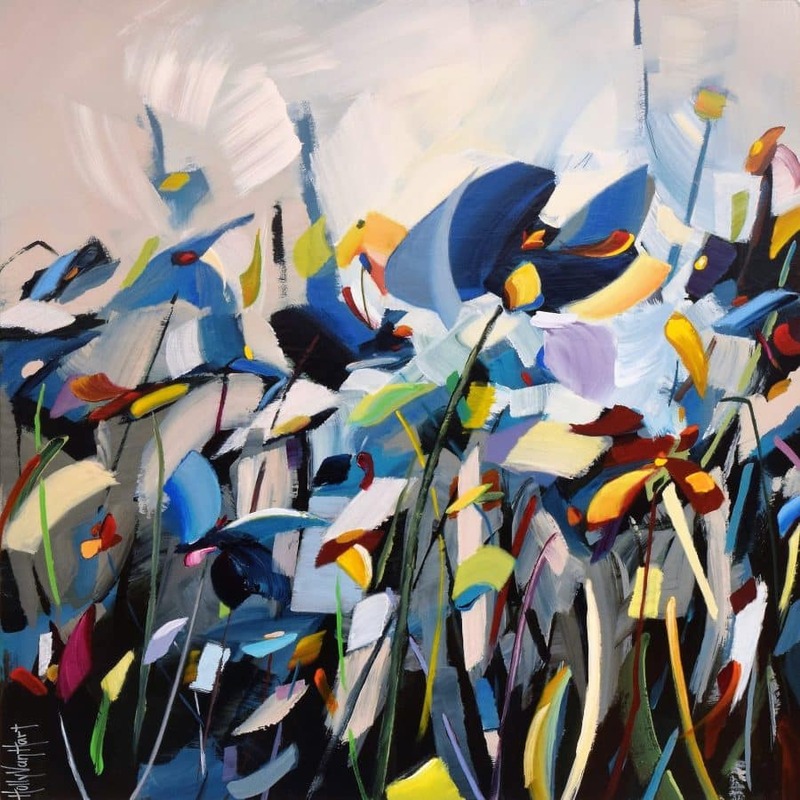 ‘Possibilities in Full Bloom’ is meant to convey the idea that life is chock full with possibilities. The eggs in the nest are radiating warmth, and the magnolia tree is loaded with lush flowers. Life abounds! This painting was fun to create for many reasons. One of my favorite parts was leaving the underlying red color and texture showing through in many places. (Can you see this? Click on the image to see a larger version.) To me, this gives the work a fresh feel. Living a life of abundance means so many different things. For me, part of the satisfaction of an abundant life includes sharing with others. 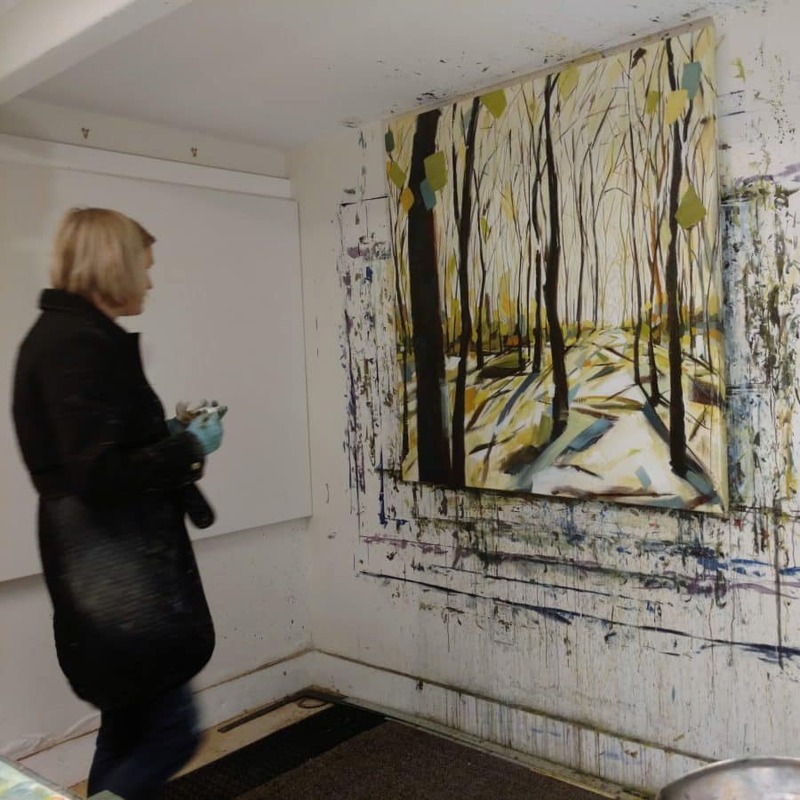 I love it when friends, artists, gallery owners, curators and others share their secrets with me. Even after all these years here on earth, I have plenty to learn about life, love, art & everything! ‘Divulging the Secrets’ is a celebration of sharing! 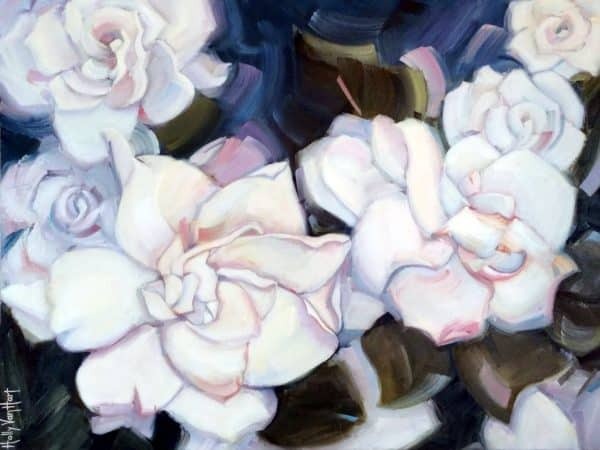 To see more flower paintings and read more about their inspirations, click here. What do you find fascinating? I’m wondering . . . what do you find fascinating in life? 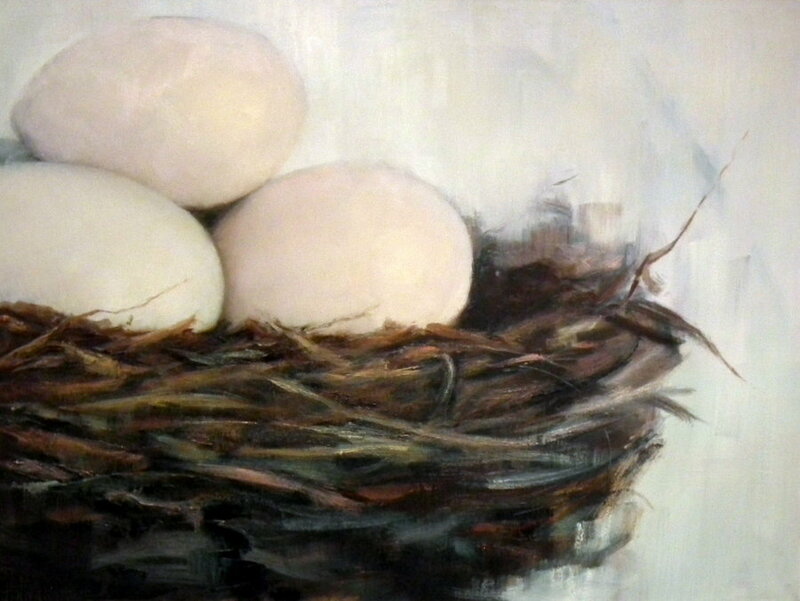 Abundance is part of my Possibilities series that includes nests and eggs as the subject. 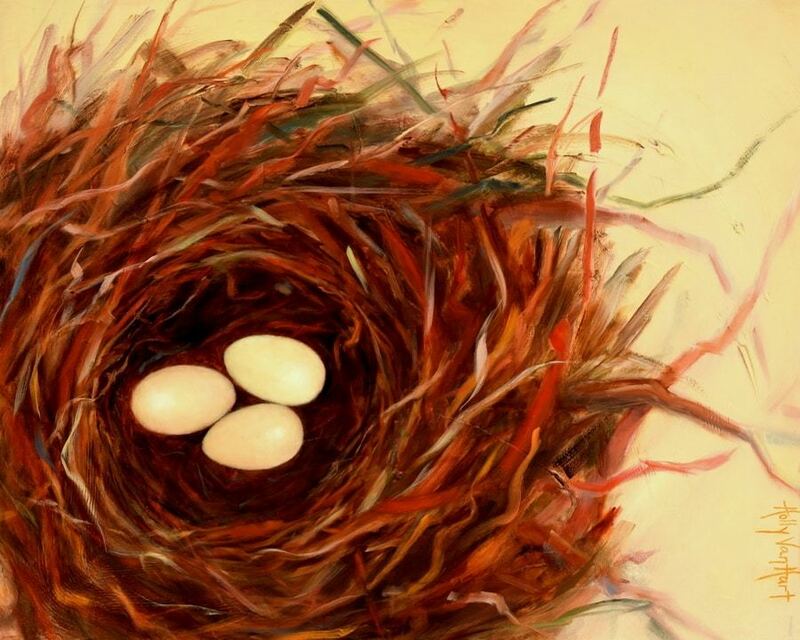 This painting signifies the abundant possibilities that are available to the little lives that are in this very full nest. 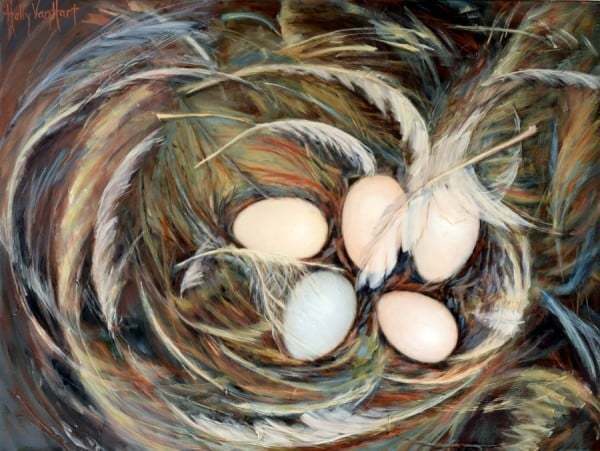 The calm of the surface of the eggs is offset by the variety of colors and complicated weaving of the nest. This contrast reflects the reality of our lives, which are often some combination of calm, colorful, and complicated. 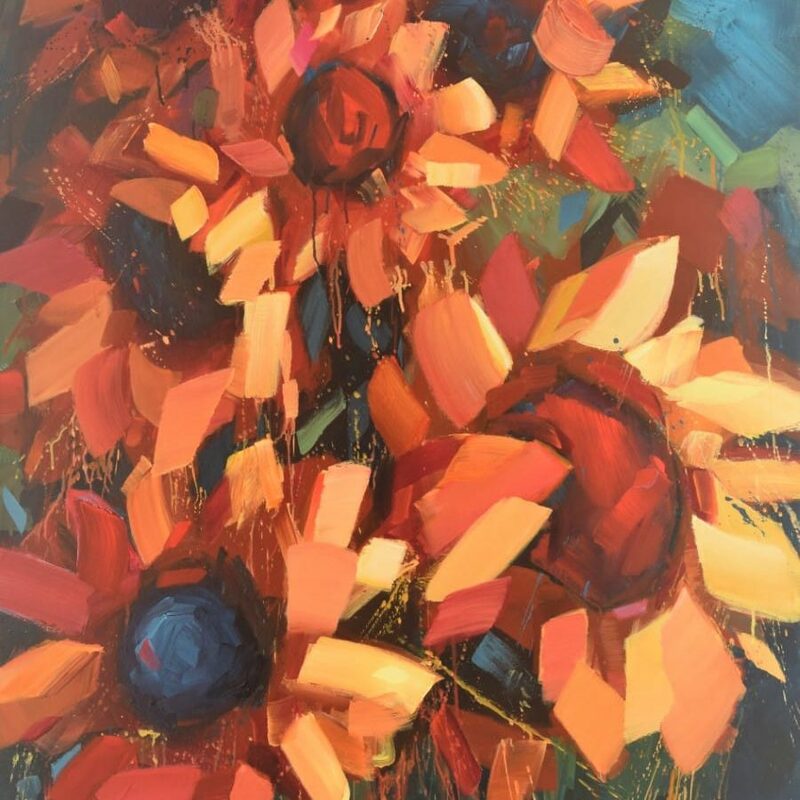 Like most of my work, Abundance was built up using multiple layers of oil paints. The layers give a special glow to the eggs, and extra texture and depth to the nest. This painting is sold, but you can buy a print here. 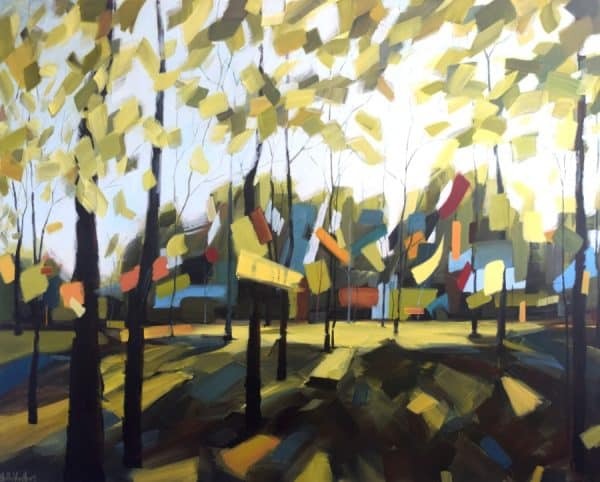 Does ‘Wandering in Wonder’ make you want to wander through this forest? And take in the wonder of nature and life? Hope so! 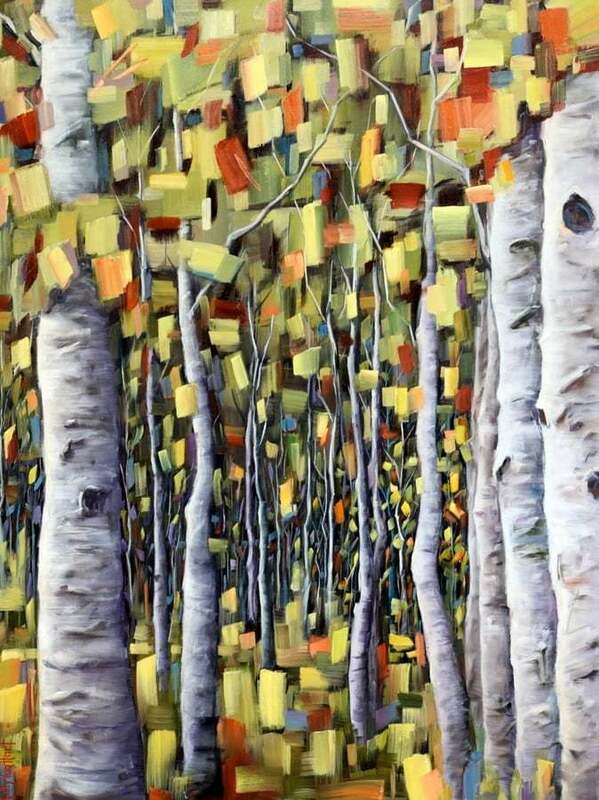 Wandering in Wonder is currently hanging in my home, but it could be in yours! To purchase, email holly@hollyvanhart.com. Free shipping in the US. Possibilities in Full Color is about the lives within these 3 eggs, still to be lived. They are meant to be ‘full color’ lives, filled with joy and delight and exciting challenges. 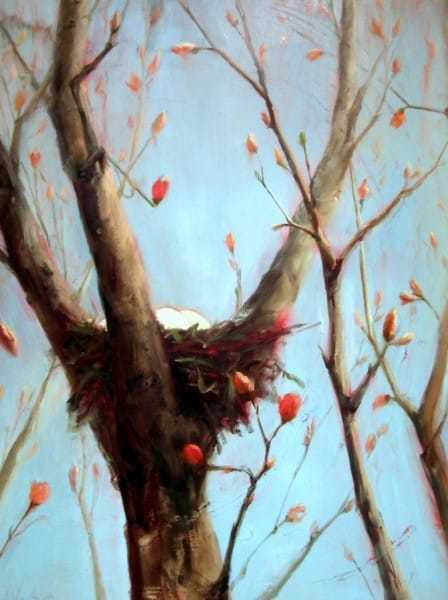 This painting is also about the homes (nests) of the baby birds and their parents. Do you see the reds, oranges, greens, blues, and yellows? This ‘full color’ nest represents the unique and wonderful personalities of all the individuals that live within it, as well as the wonderful variety of homes that birds build for themselves. 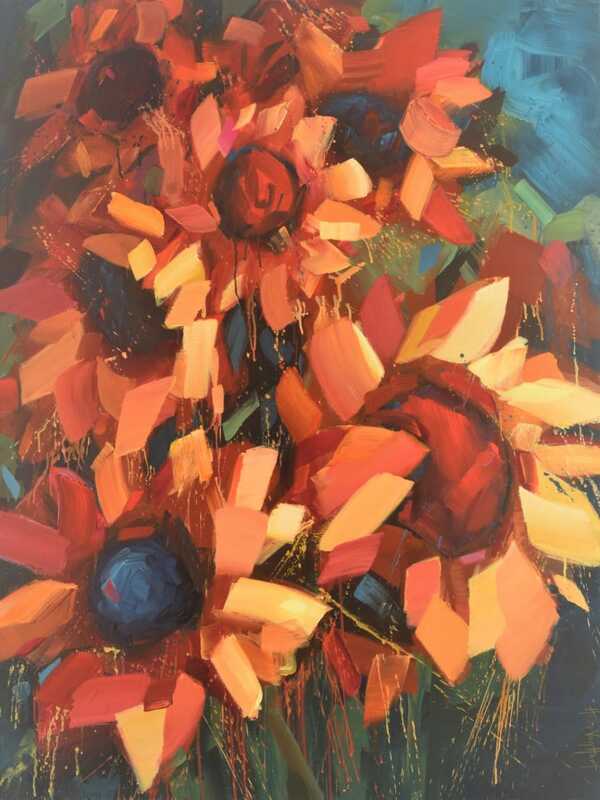 What do you see in “Possibilities in Full Color”? It’s always fascinating to learn how paintings are interpreted. I’d love to hear your thoughts and comments (holly@hollyvanhart.com). 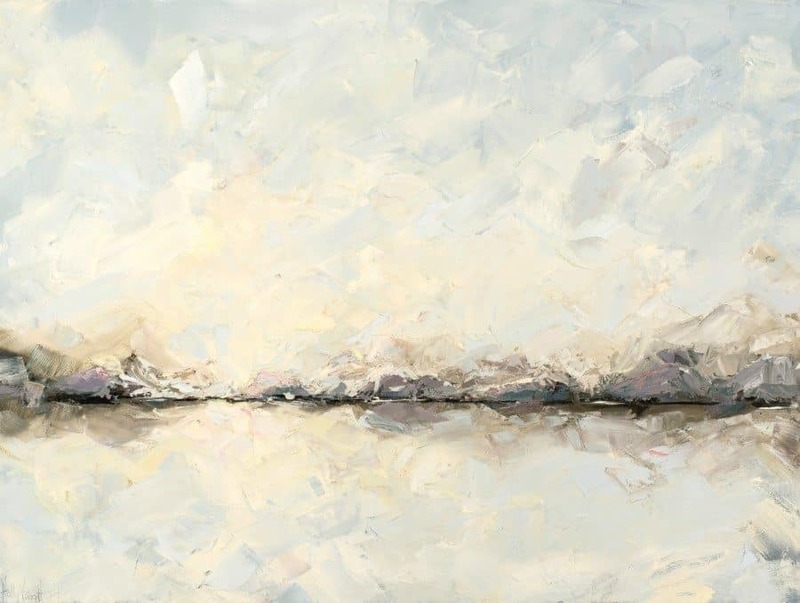 This painting is available from Bluestone Fine Art Gallery; click for details. Adding some sparkle to your day! My intent for Winter Sparkle was to create a winter scene that draws you in. I wanted the path to be inviting. 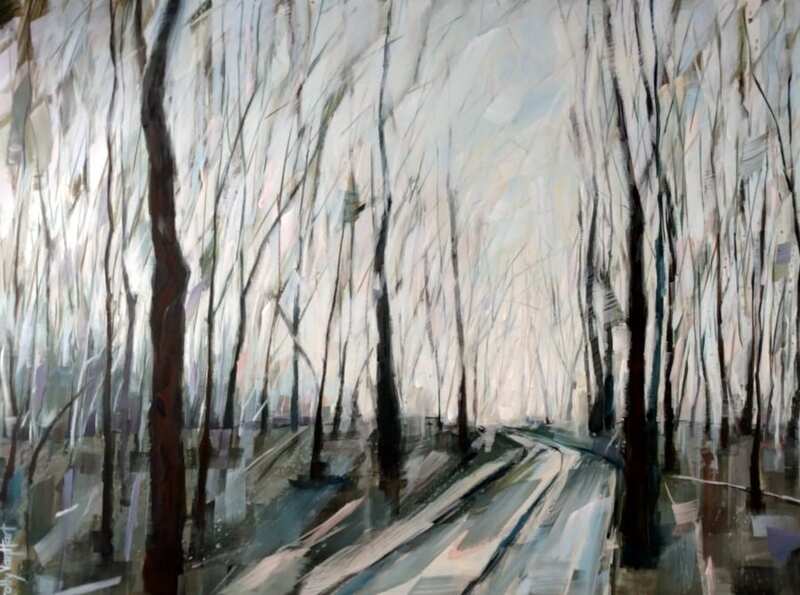 The painting was intended to give the feeling of one of those cold, wintry days that makes you feel so alive! 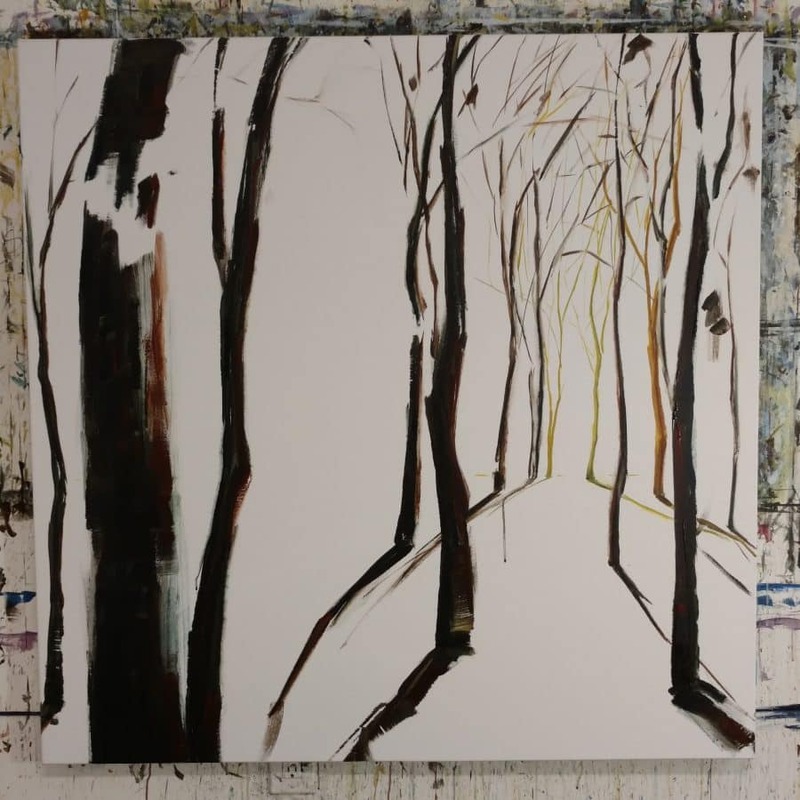 This painting is inspired by the same forest as my painting entitled Summer Sparkle. Same forest, different season. 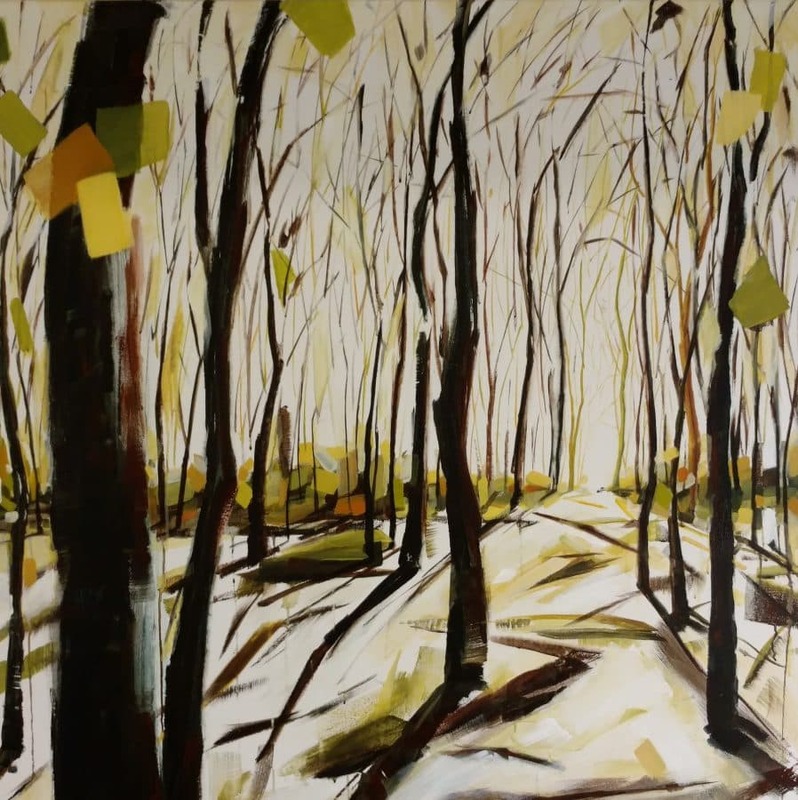 To see the latest spring, summer, fall, and winter forest paintings, click here. To see the pics and video of the making of Summer Sparkle, click here. 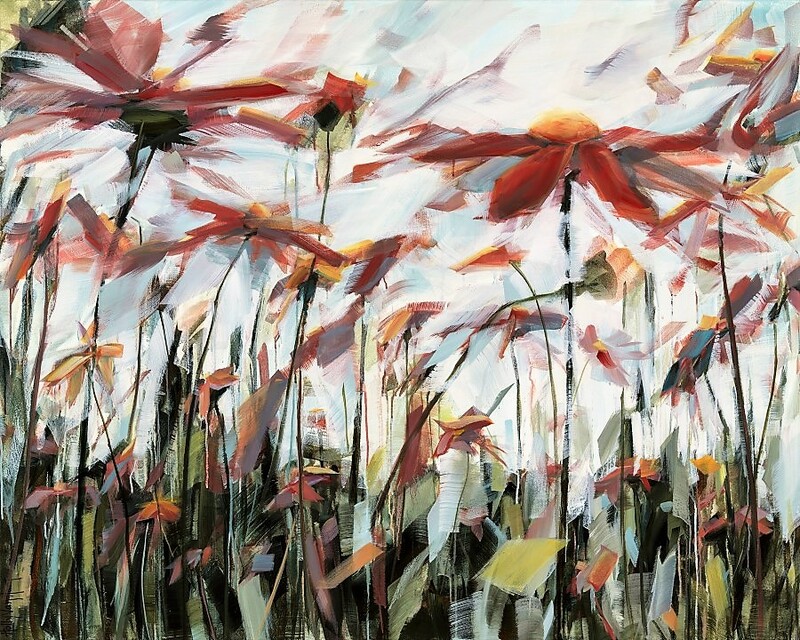 ‘Springing’ got its name because (to me) it looks like the whole painting is springing to life. 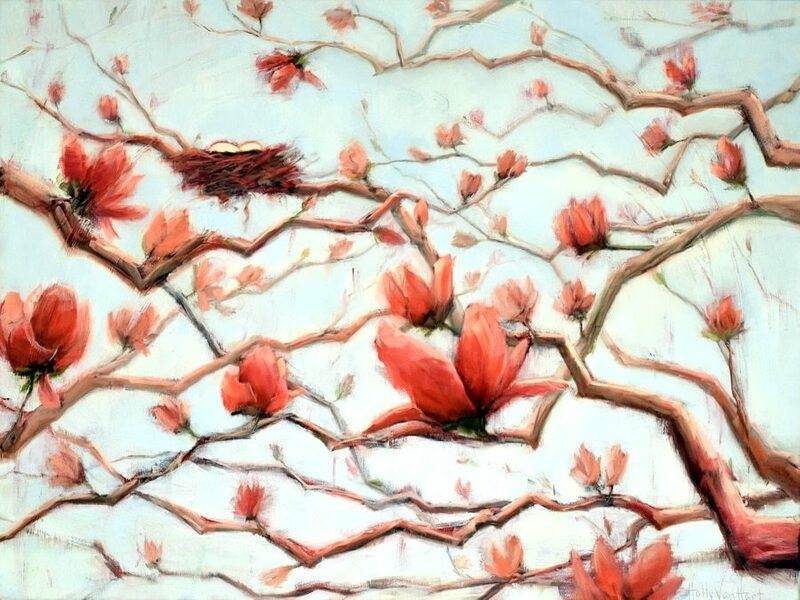 A nest with 3 eggs, a tree with dozens of red flower buds, and sweeping textures are all combined to give the painting a certain energy and vivaciousness. This painting now resides in a beautiful home in the UK. 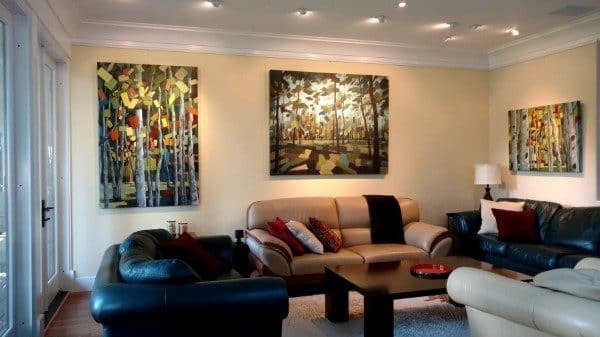 To see available paintings, click here. btw, if you’re wondering ‘What’s up with all the nests?’, click here. Have you ever tried meditation? I’ve tried it multiple times, including a 2-day class in Indonesia, but failed miserably each time. I can’t calm my mind in that way. 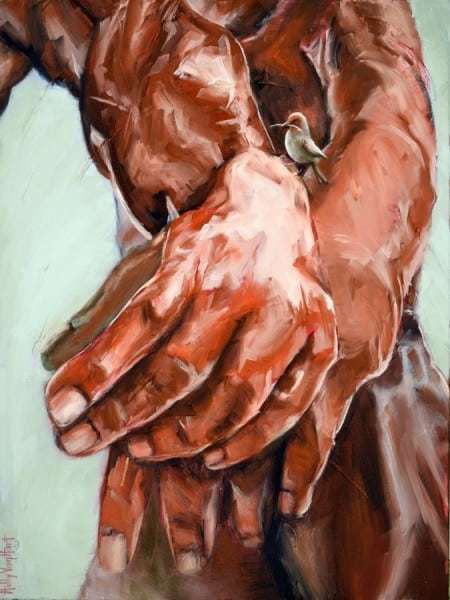 On the other hand, the act of painting has a meditative quality to it that I love. 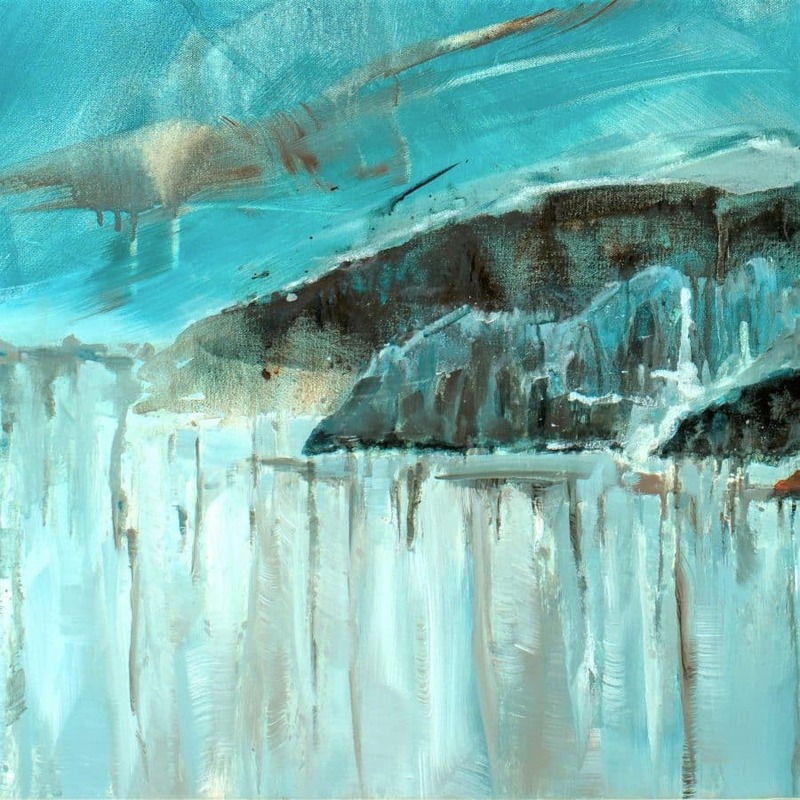 Painting can completely absorb me and transport me to a different place. 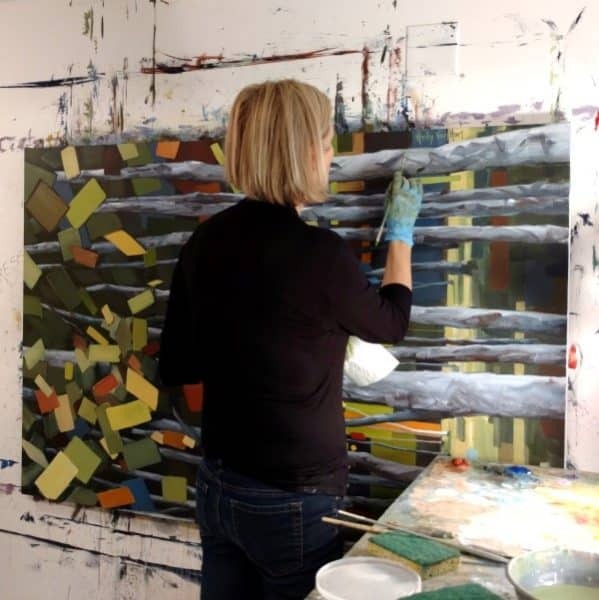 My paintings often go through a bunch of twists and turns before they are done. Sometimes, by the end of all that, I don’t quite remember how things progressed along the way. ‘Alternate Reality’ (shown above) was a painting that was totally absorbed me like that. It felt so refreshing. Lucky me. Do you have a meditation practice, activity, hobby or job like that? If so, lucky you! If you feel like sharing your answer, please drop me a note at holly@hollyvanhart.com. After giving lots of thought to this question, and tossing aside a few false starts, I found my answer . . . ‘To be successful in your career, you need to work smart, work hard, and add a healthy dose of self promotion.’ In the past I was pretty good at the 1st two (working hard and smart), and totally oblivious to the self-promotion part. I’m starting to get better at it now (if I didn’t, no one would know my art existed! ), but still have plenty to learn. Do you have any tips? I’m all ears! P.S. 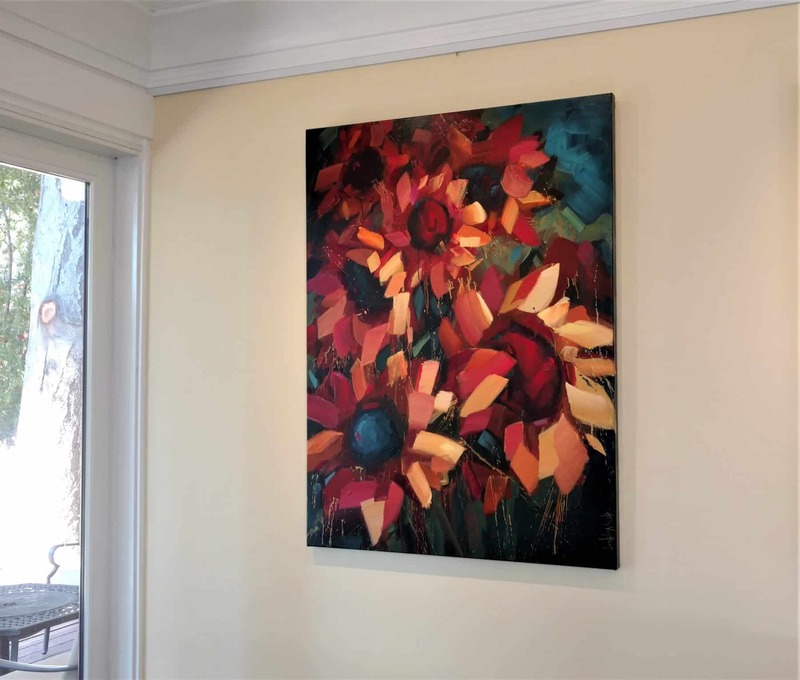 Speaking about self-promotion, the painting shown above is named ‘Every Restless Night’ and it’s for sale 🙂 The price is $6,500, including shipping within the US. If you live nearby, I can come to your home or office and hang it on the wall for you. 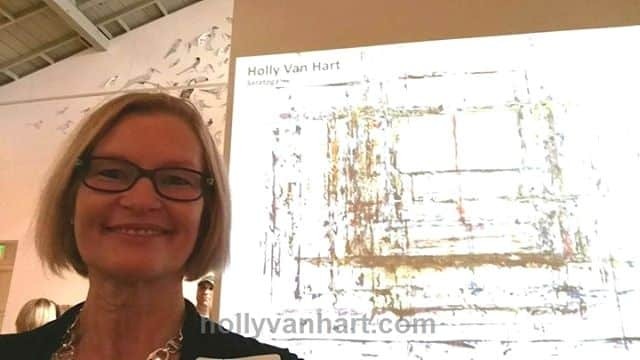 If you’re interested, email me at holly@hollyvanhart.com. Hi there. Hope you’re well! We’re experiencing hot summer weather this week, but it feels like Christmas! 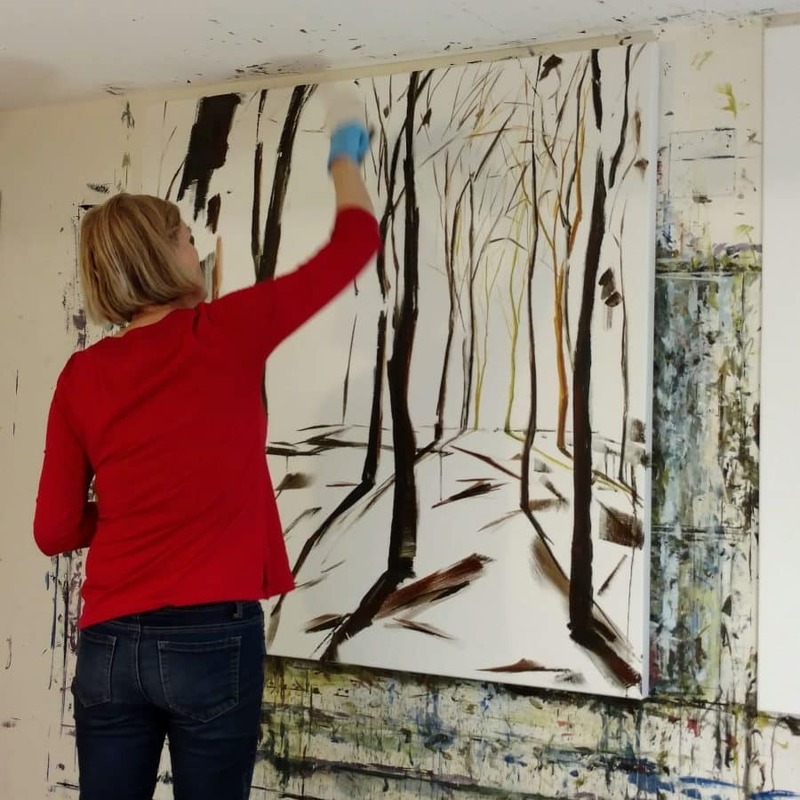 Big paintings require big brushes. 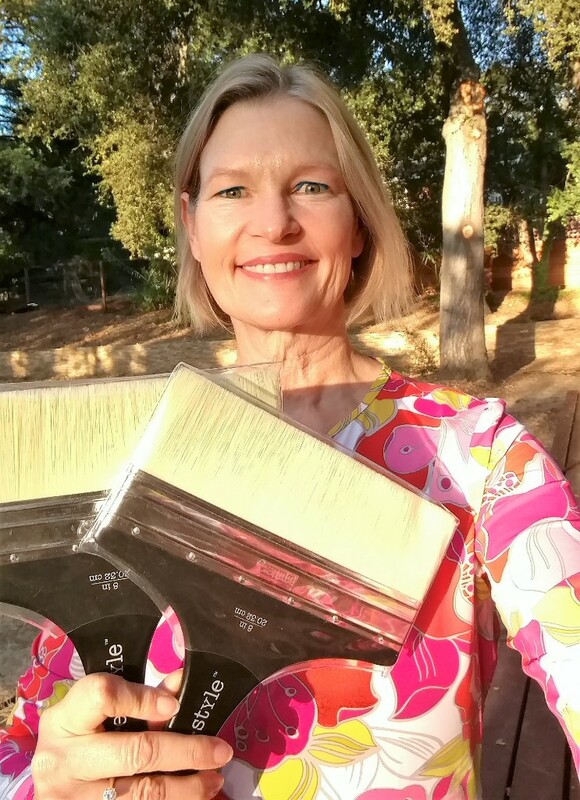 And my previous 8″ brush is worn out. Can’t wait to dip these babies into some fresh paint!! 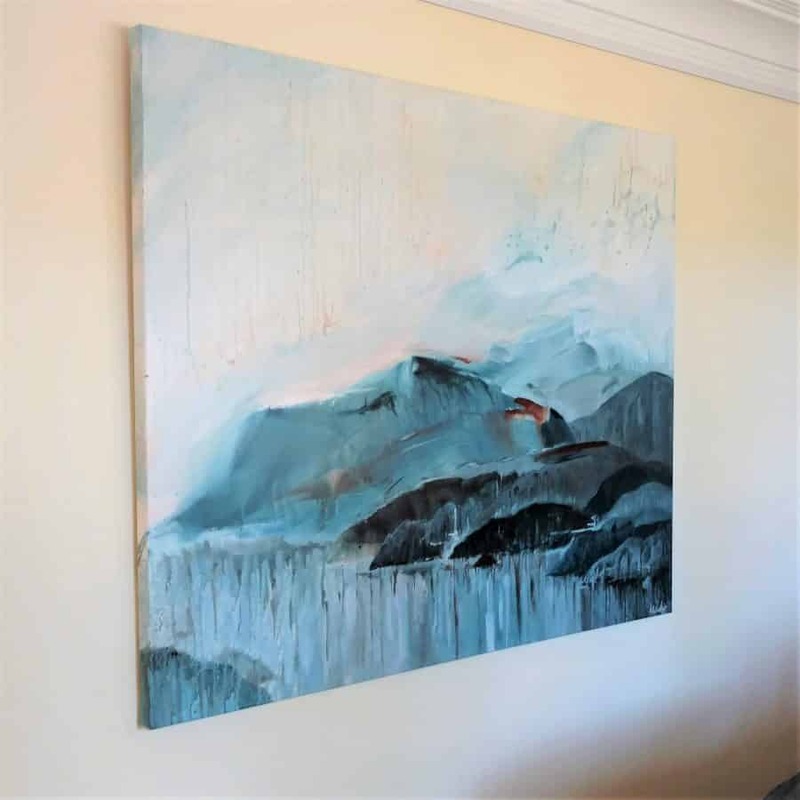 32 x 32″ mixed media painting by HVH, Available. 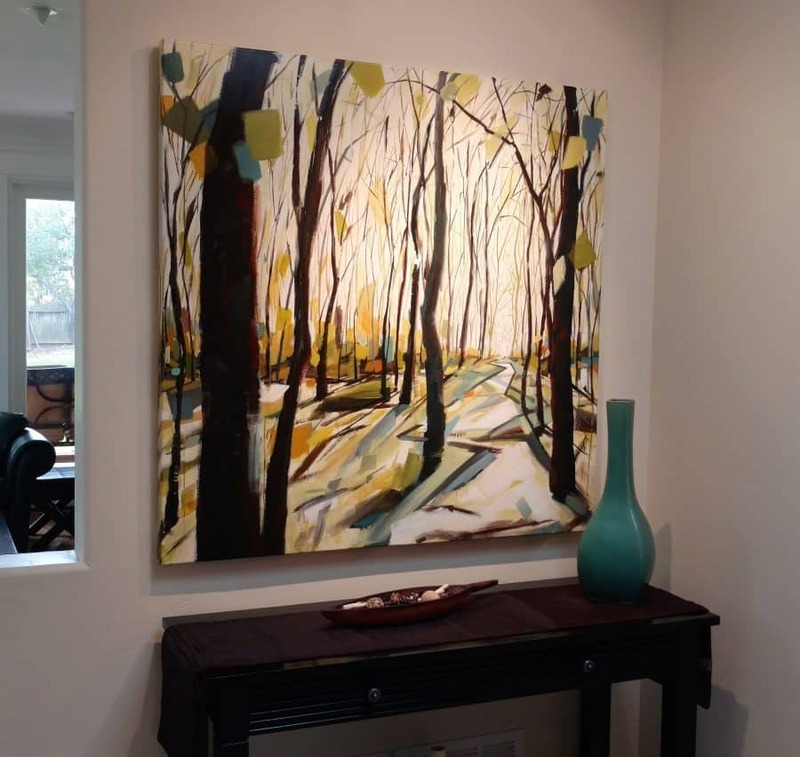 32 x 32″ mixed media painting by HVH, Sold. These inspiration behind these paintings is about secrets, specifically, about sharing secrets. What secrets might you like to share?!! Thanks for being here, my most amazing friend! P.S. Want to see what else is available? 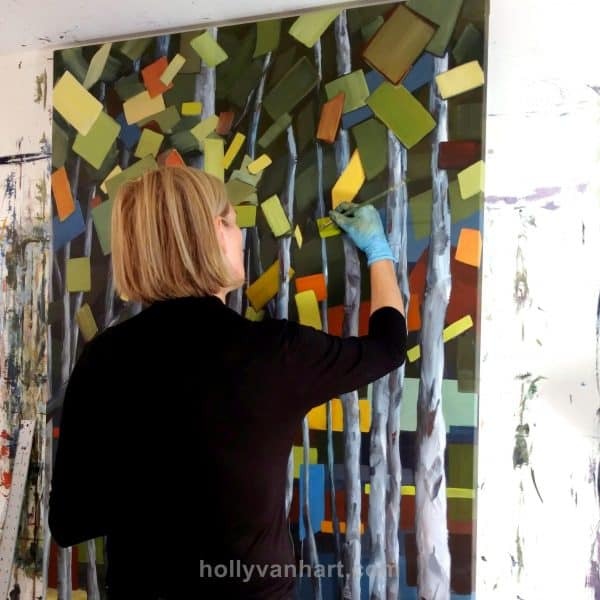 To purchase a painting, email me at holly@hollyvanhart.com. 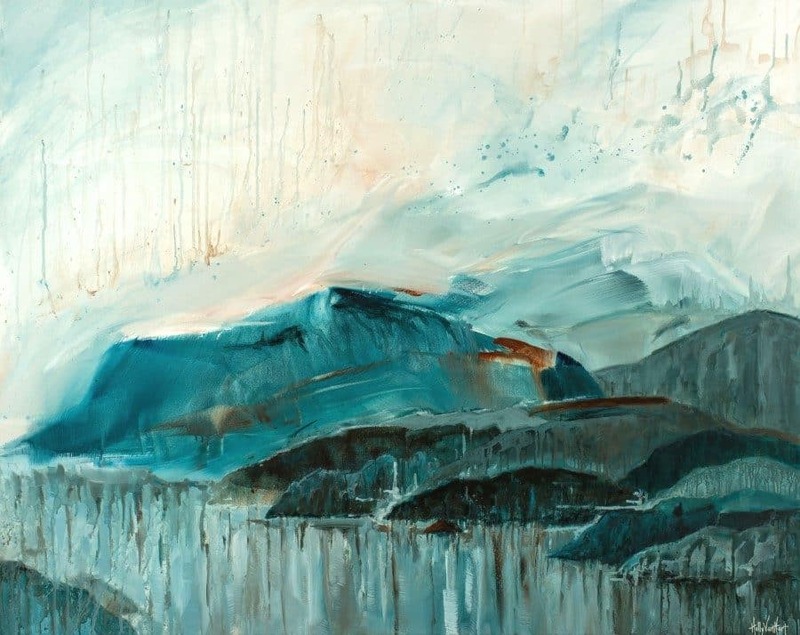 ‘Autumn Cruise’ is about the majesty of the mountains and the allure of the alpine lakes. 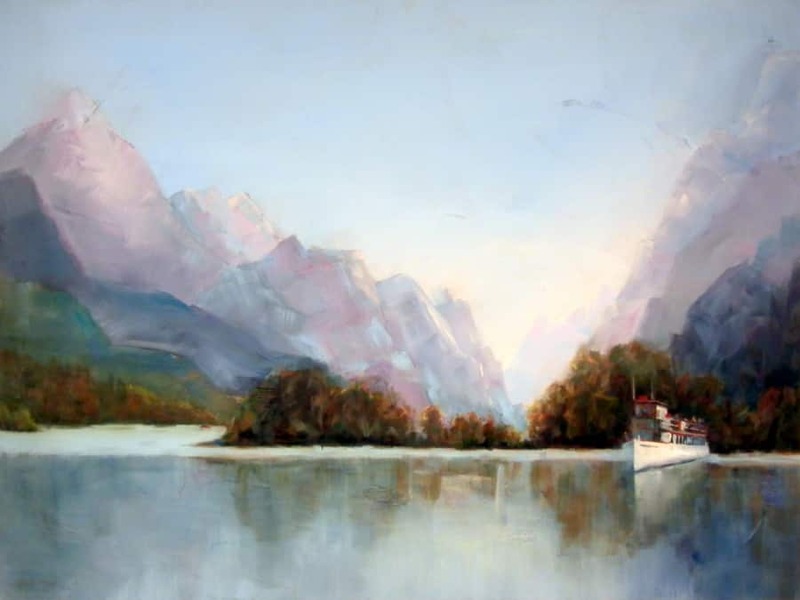 This painting includes two cruise boats ready to take us on a tour of the lake, up closer to the mountains. The unusual textures in ‘Autumn Cruise’ (for example, in the sky in the upper right, and skirting the mountains in the upper left) are there to remind us of nature’s unseen forces – potential rainstorms, winds, avalanches, floods, and hungry bears. Nature is beautiful and alluring, and also commands the utmost of respect. Ready to cruise up the lake? Sure, it’s a crisp, clear autumn day and looks like a safe bet. (If there were dark clouds overhead, then it would be a different story. btw, if you’d be interested in some art freebies (free art books and more), click here. Trees can have a commanding presence, especially when they are tall. Do you love being surrounded by towering forest? I do! 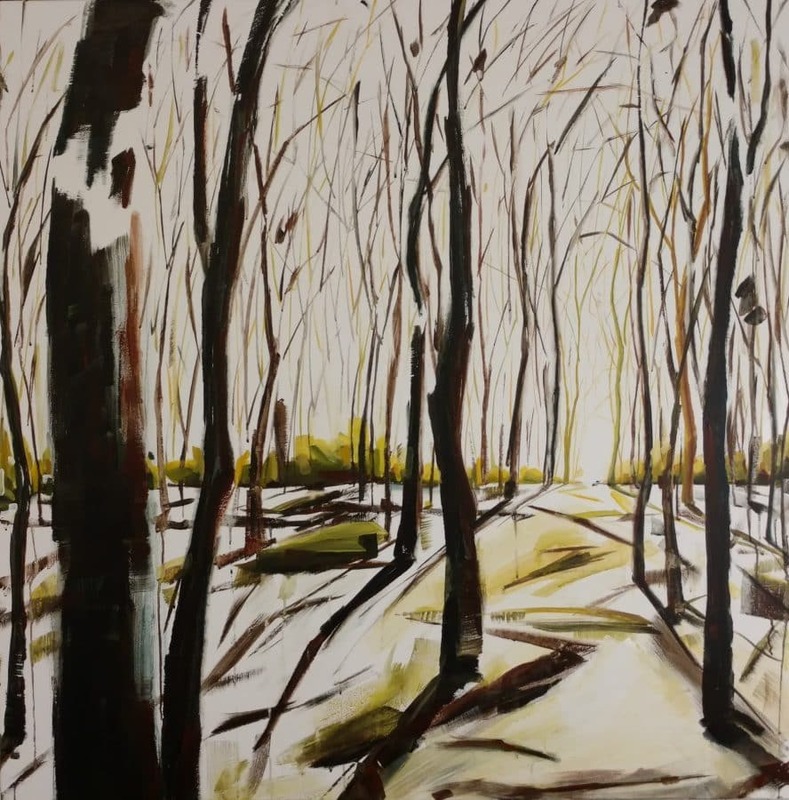 The first step was to loosely paint very tall tree trunks. Next, I started adding leaves (upper right). Next, I painted the leaves, and the shadows on the ground. Studying what to do next. I decided to brighten up the leaves in the foreground, and add more colorful leaves in the background (using heavier texture). 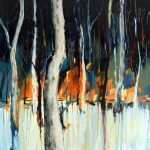 Want to be the 1st to see pre-release paintings? Click here to become a VIP member. You know that sense of grandeur we get when surrounded by a beautiful forest? 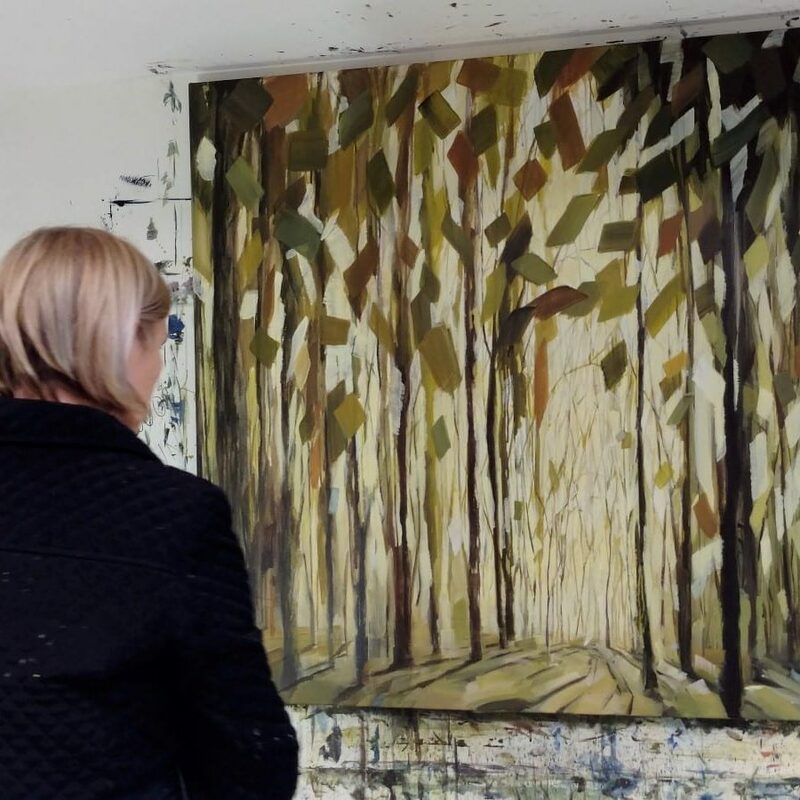 That’s what I was aiming to capture with this painting, Woodland Symphony. 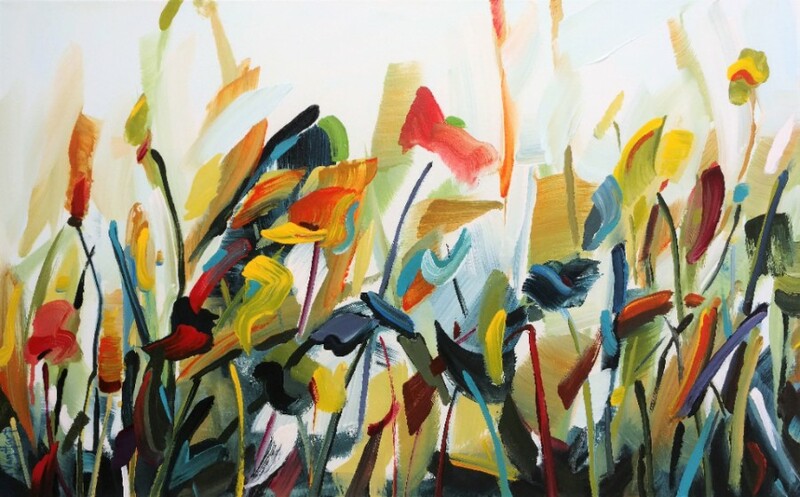 When giving this painting its name, the word ‘symphony’ came to mind. In a great symphony, all the musical notes work together in intriguingly complex and beautiful ways. 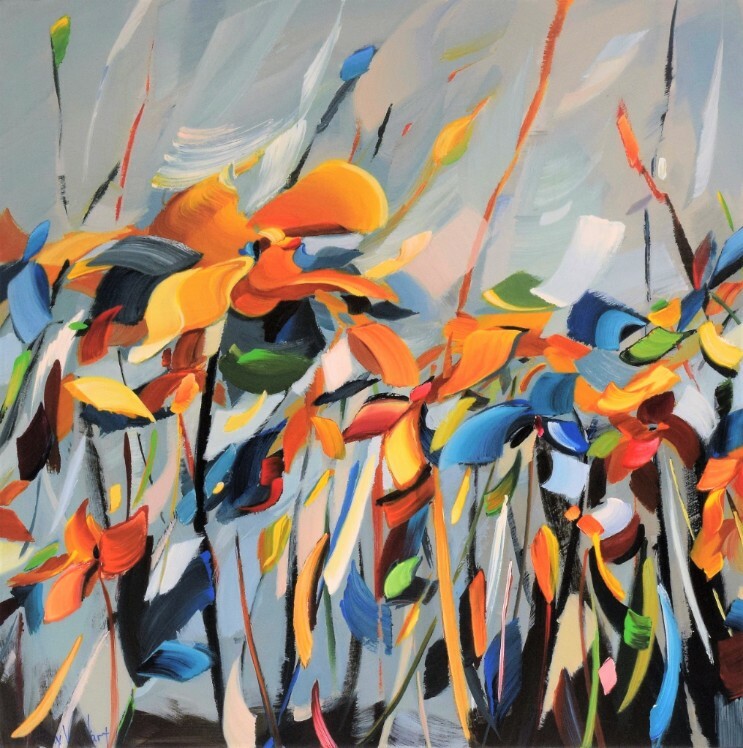 In a painting, the color notes have to work together in similarly intriguing ways. Thanks for stopping by. 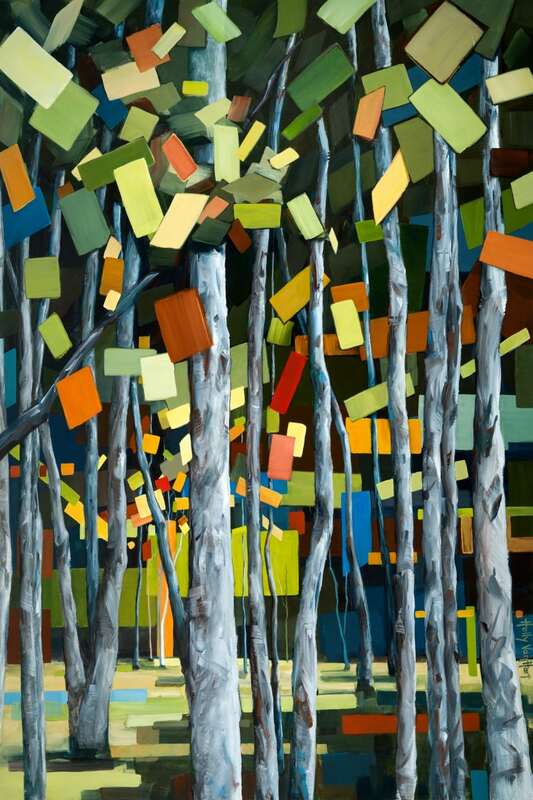 If you’d like to see more abstracted forest paintings, click here. 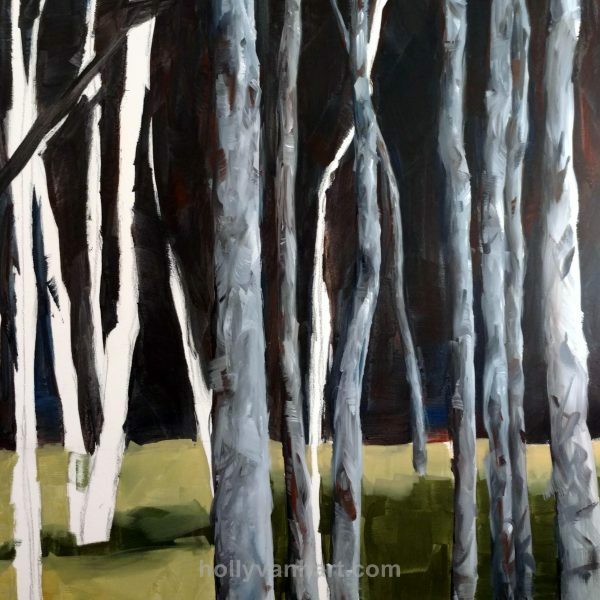 For purchase info, email holly@hollyvanhart.com. There’s also a personal story behind ‘Celebration’ . . . In ‘Celebration’ the birds have built their nest with twigs and ribbons. 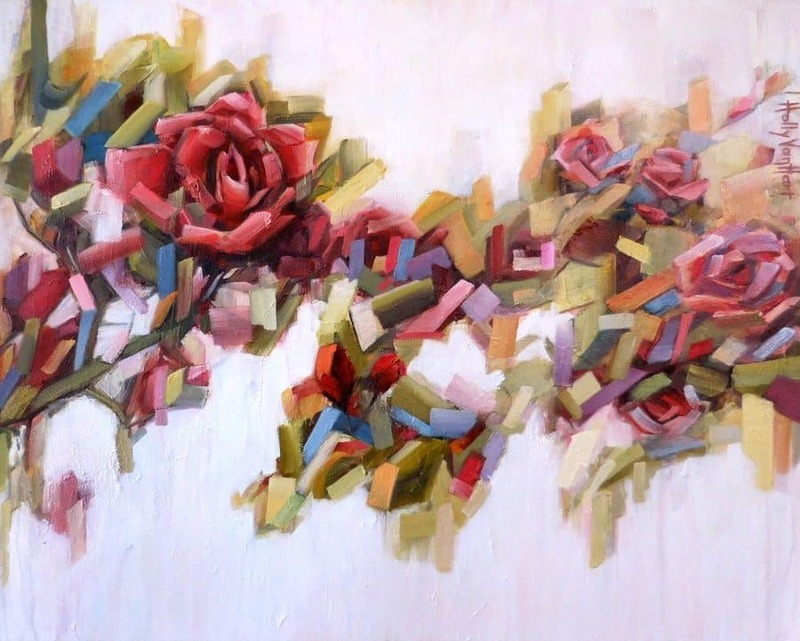 To me, ribbons have a celebratory feel, hence the title of the painting. 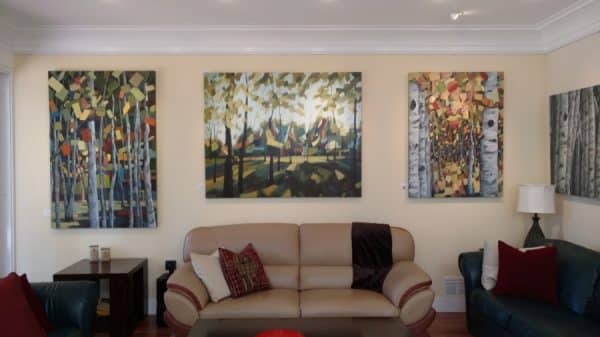 This painting was created in phases over many months. 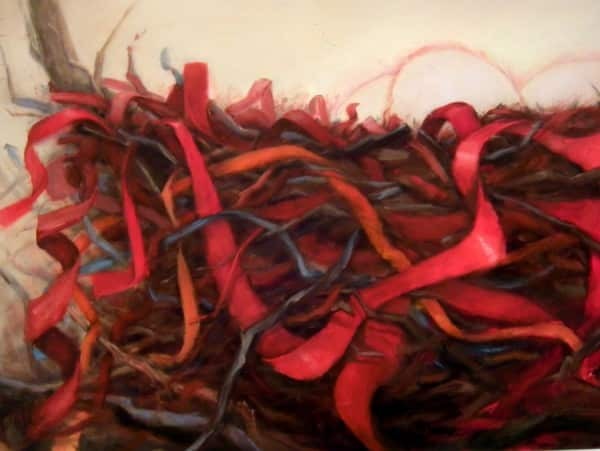 It leverages what I learned about painting nests and eggs from the other Possibilities paintings, as well as reference photos for the ribbons. Are you in the mood to celebrate?